Microsoft has been demonstrating the first official hardware prototype of an LG-manufactured Windows Phone 7 Series handset which is due for commercial release later in 2010. Windows Phone 7 Series was the big news to come out of Mobile World Congress in Barcelona earlier this month, and a Microsoft rep pulled out this first concept handset when filming the Engadget podcast in New York this week. As you can see from the above picture, courtesy of Engadget, Microsoft's new mobile handset will feature a slide-out QWERTY keyboard and a touchscreen. Engadget mention that the new Windows phone is slightly thicker than an Apple iPhone, which one would expect from a handset featuring a slide-out keyboard. 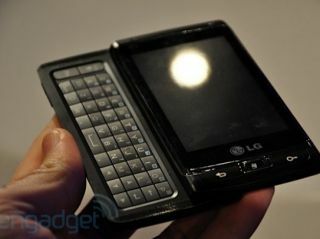 The phone also features a 5 megapixel handset. However, with September looking like the earliest possible date this handset might be available to the great unwashed, there is still plenty of time for Microsoft to up the specs and add in new features to the first Windows Phone Series 7 mobile.